We can't expect any prior announcements about Post and Go labels ("they're not stamps, we're not interested," a Royal Mail spokesman might have said), but another change seems to have taken place yesterday. First issued in new machines in October, they've already undergone one change with the addition of 'perforations' on the upper and lower edges. 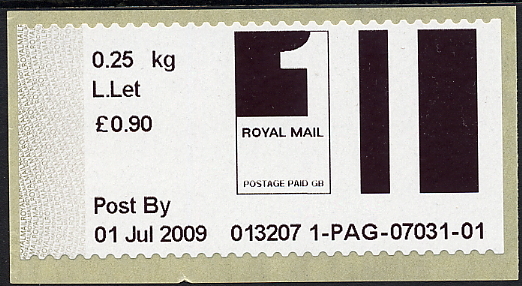 Now there is a completely new design in the style of postage that can be generated from the home or business computer, which is marketed under the names of 'Online Postage' and 'Smartstamps'. Now all we need is for the all forms of computer-produced postage to have the Machin head and collectors will really be pleased!